AItemaria is a very common saprophytic fungus. It decomposes the dead part of the plants. A few species of Altemaria can attack on living tissues. Alternaria causes diseases in plants like early blight of potatoes and boll rots of cotton. 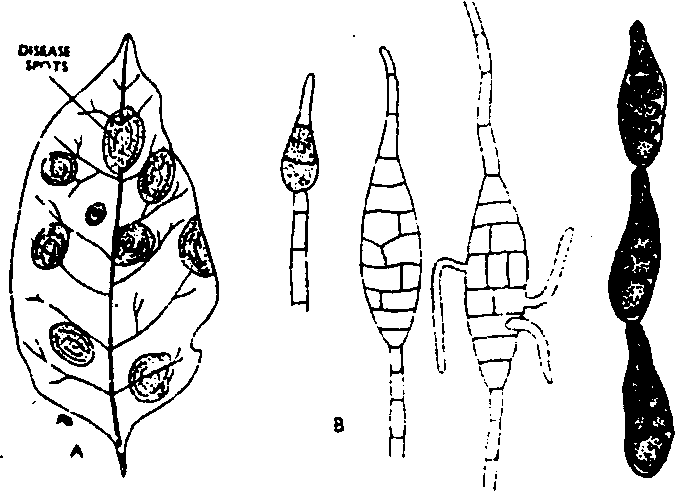 The body of Alternaria is composed of branched, septate by Mae. Its colour is dark brown. The hyphae are inter or Interacellular parasites. In case of blight of potatoes. the leaves of the infected plants develop brown spots. These spots increase in size. It ultimately causes the death of leaves. Sometimes, these spots may appear on stem and root. ; of host plant. 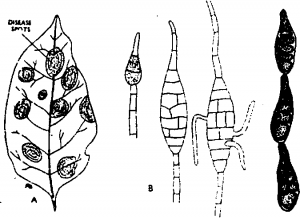 Alternaria reproduces only– asexually. 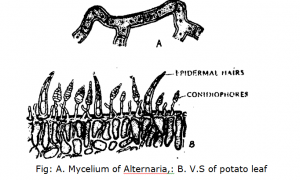 It reproduces by conidia formation. The conidia are dark coloured. They have large sizes. The” are oval in shape. They have one long beak on one side. Conidia have longitudinal and transverse septa. Therefore, conidia are multicellular. 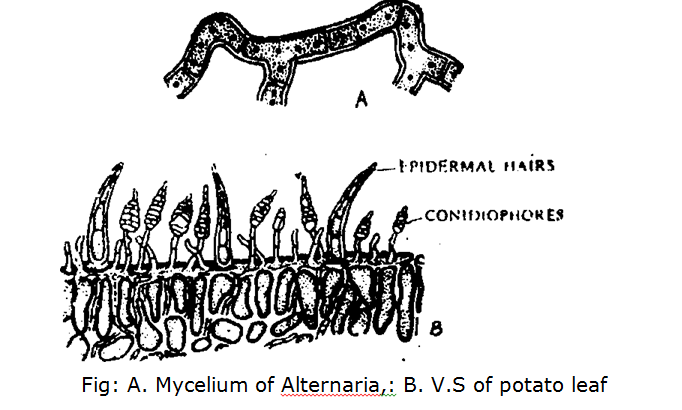 Conidia are produced on the tips of erect conidiophores. They are present in the form of chains. The wall of mature conidia has two layers. 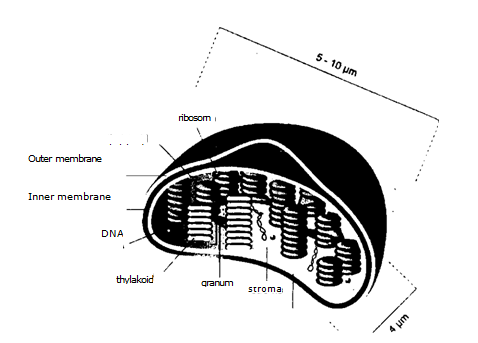 Outer layer is pigmented but inner layer is hyaline. Conidia are dispersed by wind. Conidia germinate in favourable conditions and develop new hyphae. 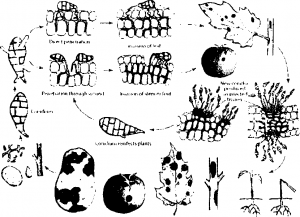 Most of species of Alternaria are plant and human parasites. At least 200/c of agricultural spoilage is caused by Alternaria species. .4Iternuria solani is a fungal pathogen. It causes a disease in tomato and potato plants called early blight. It produces small, darkened lesions on the plants that spread into groWing black spots of dead tissue. It often kills most of the pla..it in the long run. 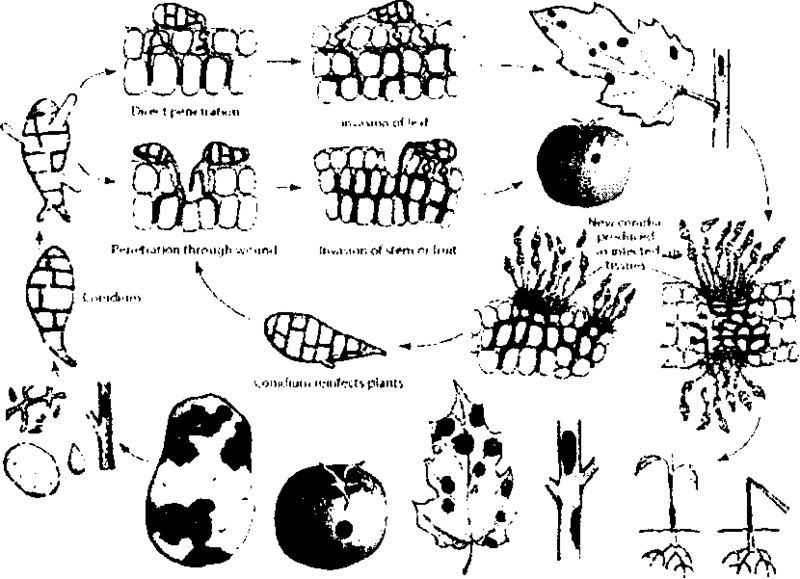 Seeds infected with the disease may even damp off luring germination. 2. They are also common allergens in humans, growing indoors and causing hay fever or hypersensitivity reactions that sometimes sead to asthma. They readily cause opportunistic infections in ‘mmunocompromised people such as AIDS patients.